A detached period farmhouse that has been significantly extended and improved using the highest quality materials and fitments. Situated in Bleasdale, Chipping in the beautiful Ribble Valley set against the spectacular backdrop of Fairsnape and Parlick Fells with views to Beacon Fell from the front. The property has good access for both Clitheroe and Preston and is a 20 minute drive from the renowned Stonyhurst College at Hurst Green and the M6 Jct.32 at Broughton, with Manchester easily reached in under an hour. The vendors of this property are prepared to accept a part exchange up to a maximum value of £750,000 within any reasonable geographic location subject to formal valuation and survey. Reception Hallway, Study, Sitting Room, Garden Room, Cloaks, Dining Room, Kitchen, Utility Room, Playroom, Two Bedrooms , Bathroom, Large secure storage barn with mezzanine floor. Master bedroom with ensuite bathroom, bedroom two with ensuite bathroom, bedroom three, bedroom four ,family bathroom. 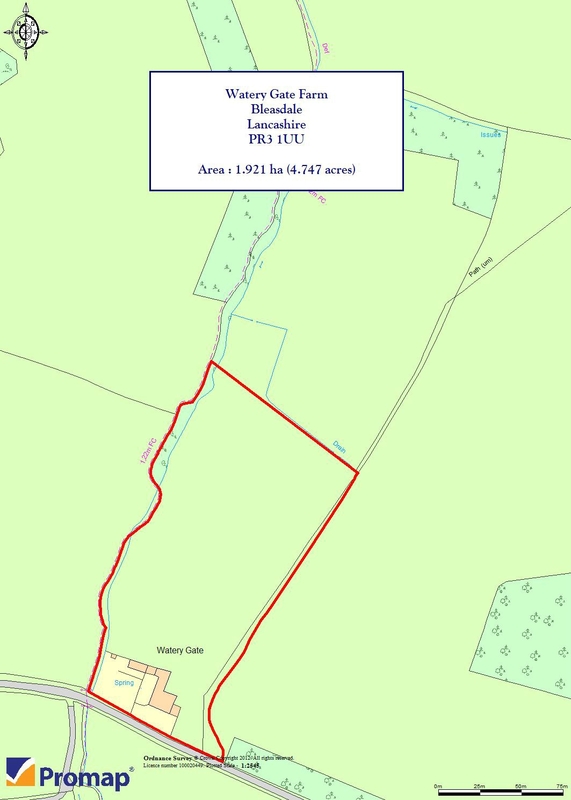 Garden areas to front and rear, adjacent paddock to the rear of the property, total curtilage extends to approximately 4.75 acres. 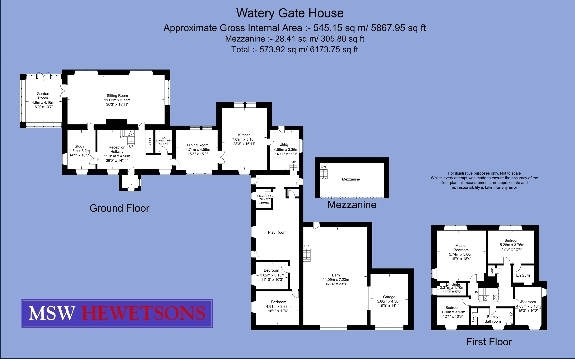 Watery Gate House is situated in an idyllic rural setting approximately 7 miles from the town of Longridge and 9.5 miles from the market town of Garstang, which both offer local amenities such as supermarkets, independent shops, schooling and garages. to business conurbations such as Manchester and London. Watery Gate House is a superbly presented and recently extended and refurbished country house which occupies a tranquil rural setting with exceptional views over the surrounding countryside. Originally, the property was a farmhouse with barns which have now been combined into a generous family house totaling approximately 5787 sq ft. The house is positioned off a quiet country lane and is set back from the road behind formal front gardens. There is additional land to the rear as well as a useful range of outbuildings. The house is accessed either through a pedestrian gate along a gravel path to the front door or alternatively via a large gravel parking area adjacent to the garaging. An entrance porch leads into the main entrance hall from which the majority of the reception rooms can be accessed. The quality of workmanship is immediately apparent on arrival with deep skirting boards, high ceiling heights, oak doors and a mass of large double glazed sash windows providing excellent natural light throughout the house. A study lies to one side of the entrance hall with the main lounge beyond. The lounge lies at the rear of the property and has a large stone open fireplace as a central feature. An open doorway leads into the conservatory which lies adjacent with a triple aspect to front, side and rear. The kitchen also lies adjacent to the entrance hall and is a particularly well presented room with a superb range of kitchen units surrounding a gas range cooker. There is a pair of sinks as well as an integrated fridge/freezer and coffee machine. The kitchen has a large central island with wooden surface and inset sink. Beyond the kitchen lies the utility room. Steps lead up to a ground floor bedroom wing with large sitting room, two bedrooms and a bathroom. The main staircase leads up to a spacious landing. There is a master bedroom with en suite, a guest bedroom with en suite, two further bedrooms and a family bathroom. All the bathrooms have been recently fitted to a particularly high standard. A substantial and particularly secure garage building lies adjacent to the main house. The garage building is separated into the main garage building with security roller doors and a mezzanine floor above. There is also a workshop area to one side. The garage is ideally suited for the storage and maintenance of a car collection. The front gardens at Watery Gate House lie between the country lane and the main house and formal lawns are separated by a gravel footpath to the front door. The gardens continue past the conservatory and are bounded by a small stream on one side. To the rear of the house are further level lawns and beyond lies a grass paddock which is ideally suited for grazing. Mains services include electricity and water. Oil-fired central heating. Private drainage. Under floor central heating. Alarm. Fixtures and fittings Only fixtures and fittings specifically mentioned in the particulars are included in the sale otherwise any garden ornaments, curtains, carpets and other fixtures and fittings may be available subject to separate negotiation. Wayleaves, easements and rights of way The sale is subject to all rights of support, public and private rights of way, water, light, drainage and other easements, quasi-easements and wayleaves, all or any other like rights, whether mentioned in these particulars or not. Notes Electrical and other appliances mentioned in the sale particulars have not been tested by the Agents, therefore prospective purchasers must satisfy themselves as to their working order.Viewing strictly by appointment through Strutt & Parker LLP and MSW Hewetsons.